Environmental Planner Darci Schofield (left) helped guide the discussions throughout the day. Participants broke down into three groups to, discussing, identifying, and organizing Medfield’s environmental strengths and weaknesses before presenting them to the larger group. 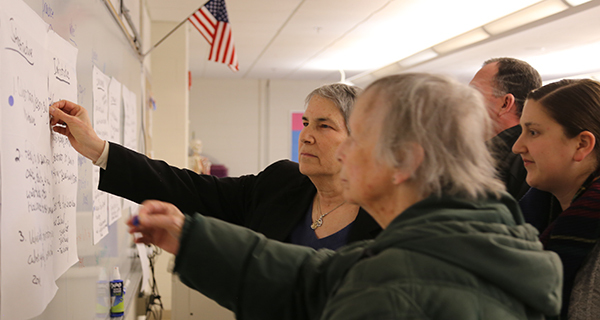 A group of community representatives met at Medfield High School on Thursday, January 31, to participate in a day-long climate resilience workshop. Put on by the Town of Medfield and the Metropolitan Area Planning Council, the day was spent discussing the potential impacts of climate change on the community, and identifying ways to mitigate those risks. The workshop was a part of Medfield’s efforts to become qualified as an MVP (municipal vulnerability preparedness) community, a designation that would allow the town to apply for funding to tackle local environmental issues. 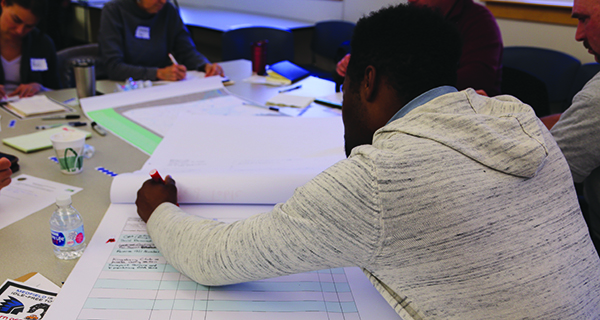 Participants spent the day listening to a presentation from MAPC Environmental Planner Darci Schofield about how climate change could affect Medfield, then discussing where they felt the community was vulnerable to environmental hazards and creating a list of actionable problems and solutions. The group consisted of wide representation of some thirty members of the Medfield community: emergency services workers, conservation organizations, infrastructure maintenance workers, town staffers, business owners, residents, and members of local government. Some participants were invited for the unique perspectives they could bring to the discussion, while others simply attended to make their voices heard. “We invited the community to come here today and do a community-based planning effort so they can bring their own local knowledge and expertise to the table, and be a part of the solution for the town,” Schofield said. Broken into three tables, participants discussed such topics as storm flooding and its potential to damage roadways and hinder emergency services, the capacity of water treatment plants and drinking water systems, tree maintenance and protection, insect-borne illness, outreach to senior citizens and other vulnerable community members during weather events, and the reliability of utility infrastructure during storms. At the end of a long day of discussion, participants voted on the issues they felt merited the most attention. As each table presented their discussions to the whole, Schofield helped guide further discussion while writing down the group’s conclusions on large sheets of paper. After the discussion, those sheets were pinned to a whiteboard and participants individually placed blue stickers alongside the issues they felt deserved the most attention. Those lists will be compiled, transcribed, and then presented at a town meeting in early spring before being sent to the state with the MVP application.